Palm muting is a great technique that can be used to sharpen the attack and reduce the sustain of notes. Since you are physically “choking” the string, it takes the treble off of a note and makes the tone warmer. The end of the string is where most treble frequencies are produced so dampening there eliminates much of the high-end build-up. It’s a particularly good technique for tightening up the sound of a part of differentiating it from something else. Strumming: Brittni Paiva’s reggae rhythm on Lochs of Dread from her album Tell U What. Picking: The intro to Heartbeat by Jake Shimabukuro on his Walking Down Rainhill album. 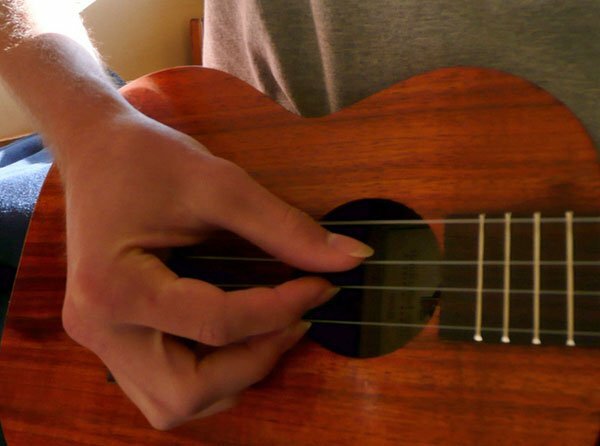 Compared to other secrets the ‘ukulele holds, palm muting is a piece of cake. Like anything, you have to experiment to get the most out of it and find the happy spot. 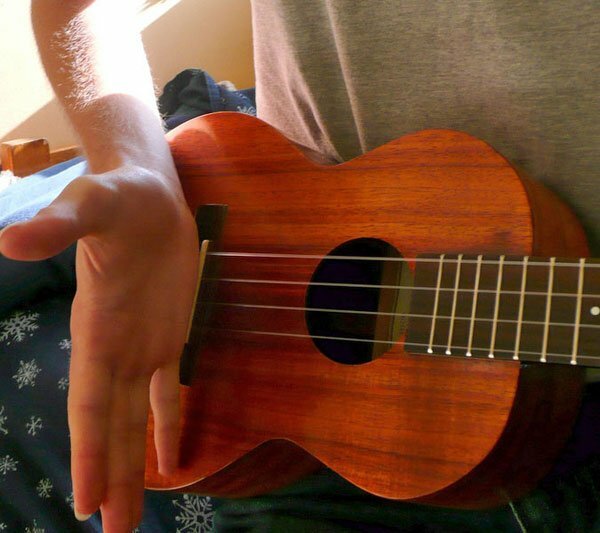 Rest the side of your picking hand on the ‘ukulele’s bridge, running parallel with it. The inside edge of your hand should rest on the strings just as they go over the saddle. Lean your hand inwards, towards the neck and curl your fingers into position so you can pick. Pick a note repeatedly and adjust how choked up on the strings your picking hand is. You can go from no palm mute to pushing the strings sharp. Experiment until you find a happy medium. When picking, it’s probably going to be easier to use a combination of some fingers with the thumb instead of just the thumb. If you already play like this, great! You’re right on track. The only reason you don’t use your thumb is because it can’t reach the high strings and still retain the palm mute. How far onto the strings you move your hand determines the heaviness of the mute. You can mute just lightly for a different tone or make the notes dissipate very quickly by muting with a heavy hand. 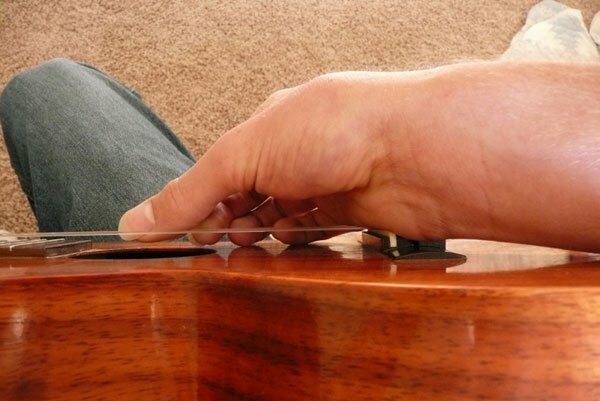 If you move your hand too far towards the neck, all notes will become sharp. Go easy unless this is the effect you are going for (like Ohta-San’s version of Little Rock Getaway/Josephine). You can play out of tune in this fashion without realizing it for a lot longer than you’d think!